Welcome to Table Talk Math. This week, Christina Tondevold is playing games with her children. Join us! Great news! For the Spanish version of this week's newsletter, click here, thanks to Ed Campos. Check it out and send Ed some love! Also, feel free to share the link (bit.ly/ttm30spanish) with your Spanish-speaking friends. This weekend, my family did our annual trip with two other families. One night we were playing a dice game and it was very interesting to see the difference in two of the little boys’ ability to recognize the amounts on the dice. One of the boys is my 3 year-old son and he can quickly tell you all of the amounts on any side of the die. The other boy is actually 6 months older than my son and can tell you the amount when it was 1, but nothing else. What I noticed during the game was these boys’ ability to subitize. Subitizing is the ability to recognize an amount without having to count. The interesting thing about subitizing is that you don’t get better at it just because you get older. Subitizing happens through the experiences you (or your child) has. So, yes my child could subitize all the amounts on the die but it isn’t because he is ‘smarter’ or has that ‘math gene.’ It’s because he has had LOTS of experiences playing with dice. The more exposure he has had to the images on the dice, the quicker he is at identifying them and recognizing the amounts. Games are such a powerful way to not only build subitizing in your children, but so many other math concepts. Our math abilities are developed through our experiences we have with mathematics. If children experience math through worksheets and tests they see math as boring (let’s be honest, how much fun are worksheets????). But if children experience math through games and puzzles and real-life problems they see math as interesting. This game is played just like Go Fish but instead of matching cards, you want to make pairs that add up to ten. Deal 5 cards to each player. On each player’s turn they can lay down any “Ten Pairs” they have in their hand, then they ask any player for a number they need (example: I have an Ace so I ask another player if they have a nine). If that player has the nine they give it to the player who asked and the play continues to the next player. If not, the other player says “Go Fish” and the player draws one from the leftover deck of cards. Then it is the next player’s turn. Play ends when one player has gotten rid of all the cards in their hand. Layout 12 to 20 cards face down in rows & columns. This game is played just like Memory or Concentration, where you are trying to find matching cards. 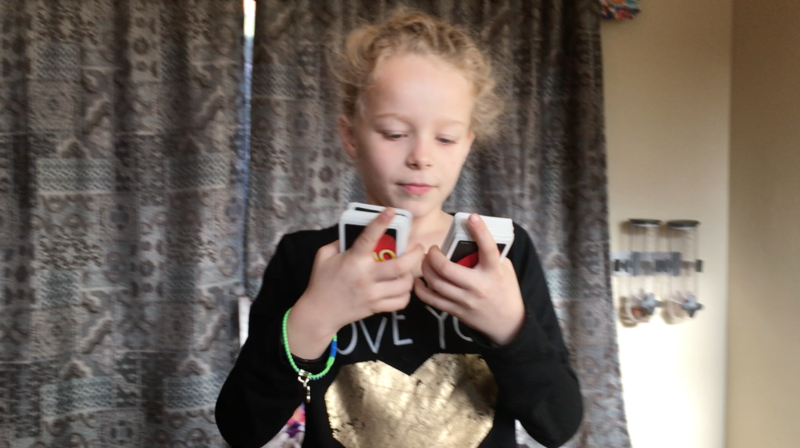 Player 1 flips over two cards, if those two cards match they get to keep those cards. If not, they turn them back over and play continues to the next person. Once Player 1 flips over two cards, it is the next player’s turn, even if Player 1 made a match. Make sure you are watching the other players so that you can concentrate on where the cards are for your turn. You can adapt this to have ‘matches’ that total a certain amount. For example, if you have younger children you can use matches that add to 5. So, you would use all the 1 & 4 and 2 & 3 cards. If you wanted to make matches that add up to 10, you would need pairs of cards that add to 10. This classic game not only builds subitizing, but kids are also working on multiplication and addition and even probability. All you need are 5 dice and Yahtzee score cards which you can find here. Two people take the entire deck of cards and deal them out face down between the two of them, so that each person has an equal amount in a pile. At the same time, each person flips over their top card. The person with the larger amount on their card gets to take both cards. If you flip over cards with the same amount, you each flip over another card to see who has the larger amount and then that player would take all the cards flipped over. Play continues until one player gets all the cards. Opportunities can come at anytime to turn something trivial into a powerful math building time, so keep your eyes open. 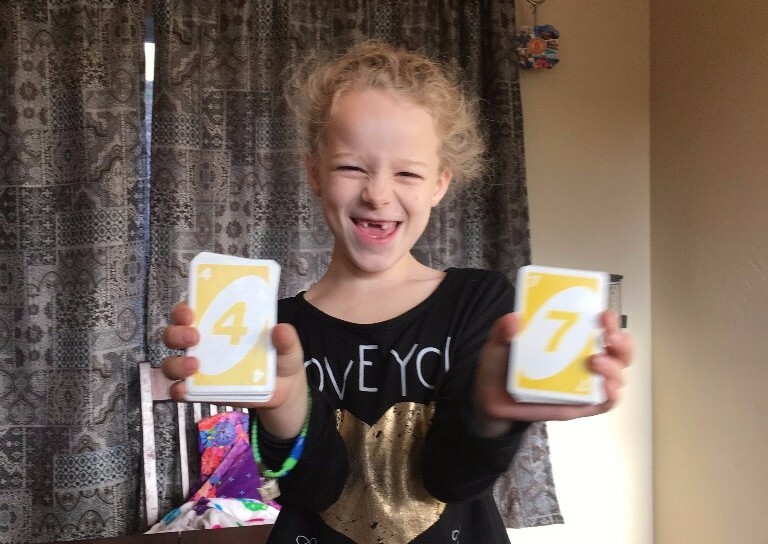 One day my daughter had the set of Uno cards and she separated the deck and asked me what cards I thought she had showing. I asked her to give me a hint and she said “They make 11.” So I started guessing what combinations would make the 11 and eventually found the one she had. This then became a game we played over and over again and it was especially cool when I had the cards and gave her the hint. It was fun for me to see her process of how she thought about the combinations possible. Building your child’s math mind can be done through the use of games. I love how fun it is for the kids and for me. They just see it as quality time with family, but I also see the underlying math that is being developed in them. If you have any questions, please feel free to contact me on Twitter (@TableTalkMath) or comment below. Be sure to have your friends sign up for the newsletter at tabletalkmath.com for weekly updates. Thank you for taking the time to improve math fluency for children, one table talk conversation at a time.